I don’t often write about technology developed to improve sleep. I’m frankly skeptical that most products (e.g., sleep trackers) could help me any more than the daily exercise I do and the habits I changed after going through CBT for insomnia. QuietOn Sleep earplugs were designed specifically to block out noises such as snoring and the droning of plane engines. Earplugs—these or any others—may not interest you if you’re a homebody and/or you share a bed with a quiet sleeper. But if your sleep is often disturbed by a snoring partner or unpleasant, droning noises, these earplugs could be a real boon. QuietOn earplugs contain a microphone that continually samples sound in the environment. They then create a phase-shifted sound that’s played through a speaker, cancelling the exterior noise out. The earplugs are battery powered and come with a carrying case that functions as a charger. You might not imagine all this technology could fit inside a gadget so small. Apparently, it does. Twenty-one of these earplugs can fit on a single credit card. Encased in soft material, they fit inside the ear canal, neither big enough to hurt you nor small enough to pop out. The one downside is the price. While limited numbers are available via an Indiegogo campaign at $149 a pair (2 pairs for $199), the full price after product launch will be $239. At last Ebb Therapeutics has come out with its novel insomnia therapy device, a headband that cools—and so calms—busy brains at night. Here’s why it might improve your sleep. The brains of normal sleepers are quiet during sleep but insomniac brains are not. In neuroimaging studies, scientists have found evidence of excessive metabolic activity occurring in our brains at night. Some of it occurs in the frontal cortex, located behind the forehead. By cooling the forehead, Ebb Insomnia Therapy reduces activity in the front part of the brain and in turn makes it easier to fall asleep. The headband has a special pad that rests against the forehead. This pad is continuously supplied with cooling fluid via a tube connecting the headband to a temperature regulator that sits on your bedside table. The circulating fluid eventually evaporates and, after about three months, the temperature regulator alerts you to the fact that the fluid cartridge needs to be replaced. The replacement kit contains a forehead pad and a fluid cartridge. 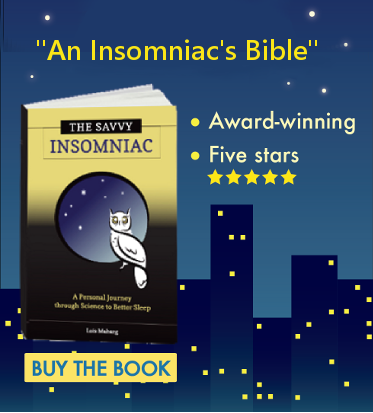 For a review of how this device may improve sleep and the tests that went into its development, see my earlier post on Ebb Insomnia Therapy. Contact the company directly to find out how much the device (and replacement kit) costs. You might not think sleep could improve with training. Michael Schwartz thinks otherwise, based on years of work as a sleep technologist and sleep educator. He’s developed an inexpensive smartphone app called Sleep On Cue that can help people fall asleep and fall back to sleep more quickly. The idea behind the app is this: Chronic insomnia often gives rise to anxiety about sleep, lack of confidence in sleep ability, negative beliefs about sleep, and increased brain activity at night. So it’s easy to lose touch with the feeling of falling asleep. The app essentially retrains you to recognize what falling asleep feels like, alleviating anxiety about sleep and restoring your confidence in your sleep ability. You conduct your sleep training sessions late in the afternoon or early in the evening after a poor night’s sleep. Lie in bed holding your smartphone. Via a simple call-and-response procedure involving soft tones and movement, the app detects when you’re falling asleep (although you may not). 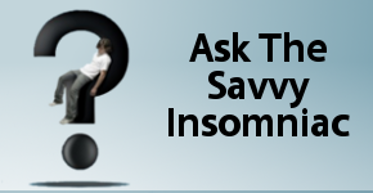 To the question “Do you think you fell asleep?” you press “yes” or “no.” Then, you leave the bed a few minutes, awaiting the next sleep trial. When you decide to end your session, your phone displays a graph with feedback about your sleep ability and your awareness of your sleep. Gradually you get better at recognizing the feeling of falling asleep. For details about the procedure and the testing behind it, see my earlier post about Sleep On Cue or go directly to the product website. Very interesting. I have tried so many things to treat my insomnia but I haven’t used technology yet. I might give it a go. The App sounds great. The app has gotten many favorable reviews from people who’ve tried it, as can be seen on the Sleep On Cue website. I believe it now costs only $0.99. At that price, what is there to lose?! It costs £4.29 in the UK. Still a small price to pay if it works and worth trying. Thanks for letting us hear about your experience with the Sleep On Cue app. I haven’t tried it myself. But I can see how a high level of anxiety could make it harder to benefit from it. Knowing that at some point the phone will emit a soft tone could increase a person’s vigilance, and anything that increases vigilance will make it harder to fall asleep. This could make it all the more advisable to practice when the pressure to sleep is high: late in the afternoon or early in the evening after a poor night’s sleep.